**With use of shampoo and conditioner vs non-conditioning shampoo. • Co-created with Thomas Taw, Dry & Damage Expert from London, so you will always have HAIR ON YOUR SIDE. 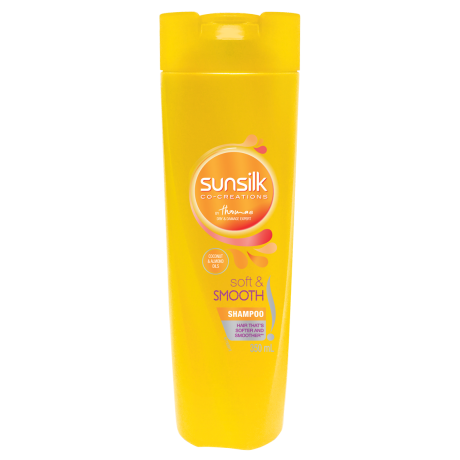 Sunsilk Soft and Smooth shampoo 350ml for Hair that's softer and smoother** **With use of shampoo and conditioner vs non-conditioning shampoo. Ready? Massage onto wet hair and then rinse thoroughly. Repeat application and use daily. For even more incredible hair, why not combine it with Sunsilk Soft and Smooth Conditioner? Water, Sodium Laureth Sulfate/Sodium C12-13 Pareth Sulfate*, Cocamidopropyl Betaine, Dimethiconol, Argania Spinosa (Argan) Kernel Oil, Cocos Nucifera (Coconut) Oil, Camellia Oleifera (Camellia) Seed Oil, Prunus Amygdalus Dulcis (Sweet Almond) Oil, Olea Euopaea (Olive) Fruit Oil, Peg-45M, Carbomer, Guar Hydroxypropyltrimonium Chloride, Tea-Dodecylbenzenesulfonate, Tea-Sulfate, Cyclotetrasiloxane, Synthetic Fluorphlogophite, Tin Oxide, Sodium Chloride, Citric Acid, Disodium Edta, Sodium Benzoate, Phenoxyethanol, Fragrance, Ci 77891, Ci 19140, Ci 17200. *Used Interchangeably.